I've been making stuffed shells for a long time but I usually make them stuffed with ricotta cheese and baked in tomato sauce. 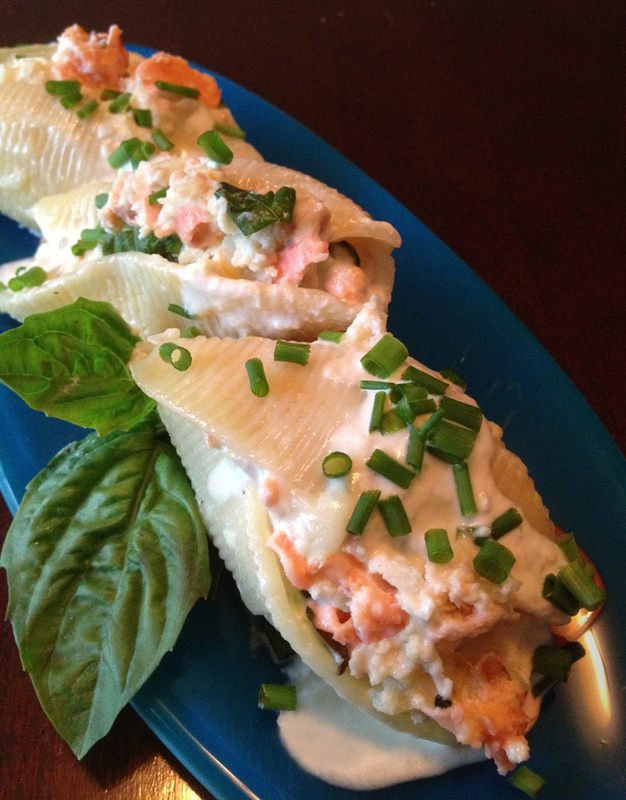 With a nod to the Pacific Northwest, I've made these stuffed shells with wild salmon. About 5 years ago, a friend explained the difference between wild and factory-farmed salmon. I stick to wild salmon now, (here's an article if you want to read more) and find it more flavorful. I stay away from canned salmon, even though most of it is wild, because I find the texture, well, odd. It takes just a few minutes to poach salmon and flake it yourself, so why not stop at the local fish market and pick some up? This recipe gets an "average to difficult" rating only because the sauce can be intimidating. It's easy though, so I encourage you to try it out. A word of caution, the shells are usually sold 12 to a box and you can count on at least one to be broken. Buy more than you need. If luck is on your side, you'll get all 12 in tact. If not, form the leftover filling onto balls, roll them in bread crumbs and bake them along with the shells. 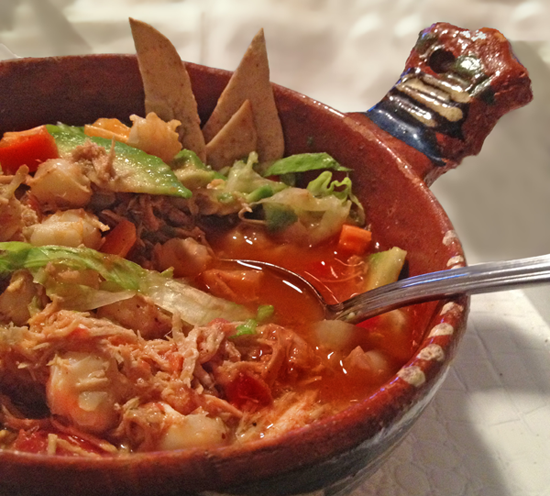 I hesitate to call this soup 'posole' because it's not made in the traditional Mexican way. There's no pork in this, I use canned hominy and tomatoes, even the broth can be commercial. I like to make most dishes from scratch but this one is so healthy that, I'd rather adapt the recipe by using organic foods from grocery store than eliminate it from the menu. This is an easy recipe but it takes some time to do it exactly as I did. You can cut down the cooking time if you have cooked chicken on hand. So, even though this isn't traditional posole, it's hearty soup and a creative way to use leftovers. You know when you're all out of ideas but want to put together a dinner that looks a little fancy, tastes great and goes together in less than an hour? Here's an option that I offer knowing that my friends and family have been under the impression that I spend a long time in the kitchen when I make this. So much for that ruse. 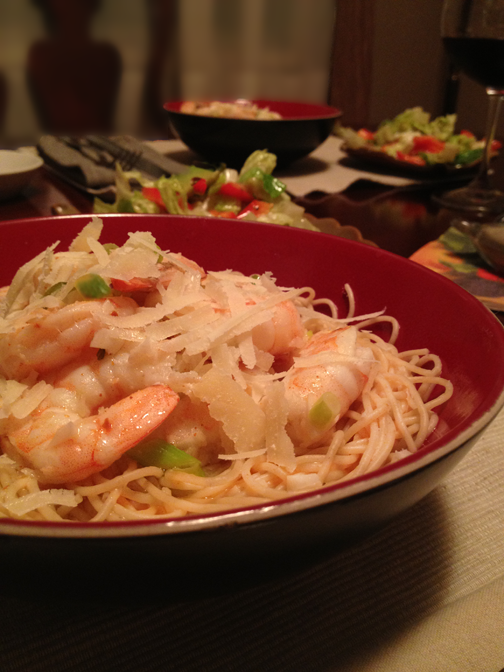 Scampi is easy and fast, especially if you buy the shrimp already peeled and deveined. This recipe starts with frozen shrimp (26-30 per pound). Shrimp is frozen right on the boat, and even those I buy at the fish market are still frozen when I get them home so I based the cooking time on using the shrimp frozen - not thawed. At first I was happy to skip a step just to save time, then I realized that I never over cook the shrimp now. If you've ever made shrimp you know how quickly they overcook. I've lowered the oven temperature and increased the cooking time. This gives me time to make a simple salad and get the pasta water boiling. This dinner was with a friend from out of town whose well-deserved vacation was starting the next day. It was a celebration and celebrations start with pre-dinner cocktails, right? This time they were ginger martinis; a tasty prelude to a seafood dinner. Does it seem like everyone has a favorite pie crust and method? As tempting as it is to make a familiar pie crust, I recommend that you try this one, specifically for tarts and tartlets. I used it on the Caramelized Onion and Chèvre Tartlets. If you know about pie crusts (I'm a novice, myself) you'll probably notice the addition of an egg yolk. That adds structure to the crust. 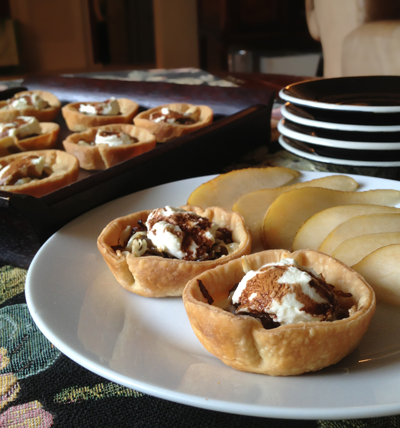 Since tartlets are served out of the pan, they need a bit more strength. This is one place where an extra crumbly crust won't be appreciated by the person trying to eat it - perhaps sans silverware. If you like the strong taste of fresh ginger, this cocktail will give you all of the ginger flavor without a strong alcohol taste. I received a bottle of Domaine de Canton (ginger liqueur) as a gift and hadn't hit on a nice drink-- until now. We were all over the internet looking for recipes, and I don't remember the source, but I respect anyone whose recipe can be so easily committed to memory. Directions: Fill cocktail shaker with ice. Pour in vodka, ginger liqueur and lemon juice. Shake well. 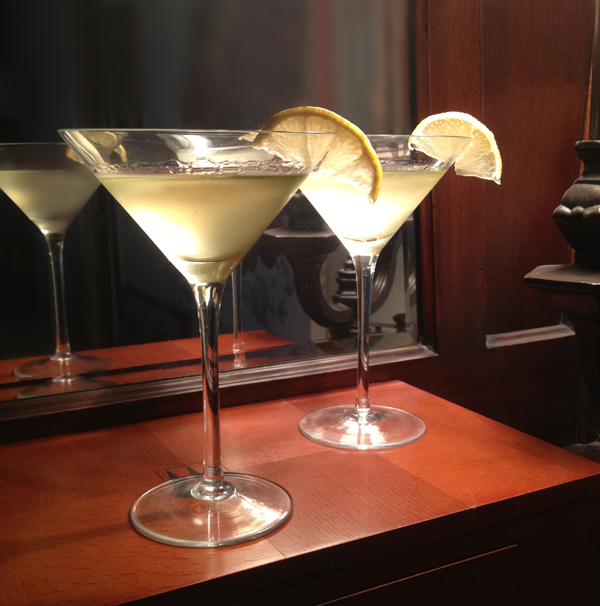 Pour into a martini glass and garnish.